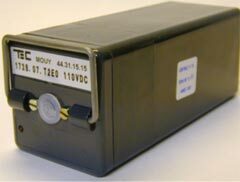 Fast action instanteneous relay with magnetic arc blowing - 4 CO contacts. - one 1783 relay, with magnetic arc blowing, for heavy contacts characteristics (breaking capability) - qalified EDF HN 45S25 cl. A1. Dielectric strength 2.500 V - 50 Hz - 1 mn.